After learning the basics of crochet and venturing into full garment production, many fiber artists are disappointed by the fit and finish of the final product yielded by standard patterns. No two bodies are alike, but there are general body types that can be taken into account when adjusting patterns to create a more customized fit. Margaret Hubert’s Customize Your Crochet: Adjust to Fit, Embellish to Taste details the four core body types and provides instructions on how to ensure that every sweater, cardigan and pullover that you crochet complements your body and showcases your handiwork. In addition, the book shows you how to express your personal style by adding decorative edging, appliqué motifs, pockets, button bands and more. Edgings can be worked separately and sewn on, or crocheted directly onto the edge to be embellished. Today, we are going to learn five sew-on edging techniques. Sew-on edgings are made separately and sewn on to the garment afterward. Measure carefully and pin the edging in place before sewing. Note: Work from the narrow end. Ch 5. Row 1: [3 dc, ch 3, 3 dc] in 5th ch from hook (shell made), turn. Row 2: Ch 3, shell in next ch-3 sp of previous shell, turn. Row 4: Ch 5, shell in next ch-3 sp of previous shell, turn. Row 5: Ch 3, shell in next ch-3 sp of previous shell, [ch 2, 1 dc] 6 times in next ch-5 sp, 1 sc in next ch-3 sp, turn. Row 6: Ch 3, 2 dc in next ch-2 sp, [sl st, ch 3, 2 dc] in each of next 4 ch-2 sps, 1 sc in next ch-2 sp (before shell), ch 3, shell in ch-3 sp of next shell, turn. Row 7: Rep Row 2. Rep Rows 4–7 for desired length, ending with Row 6 of pattern. Fasten off. Photography by Chris Hubert; Art/Diagram by Karen Manthey. Row 1 (WS): Ch 4 (counts as 1 dc, ch 1), [2 dc, ch 2, 3 dc] in 4th ch from hook, turn. Row 2: Ch 8, sl st in 6th ch from hook, ch 7, sl st in same ch as last sl st, ch 5, sl st in same ch as last sl st (trefoil completed), ch 2, [3 dc, ch 2, 3 dc] in next ch 2 sp, turn. Row 3: Sl st in each of first 3 dc, ch 3 (counts as a dc), [2 dc, ch 2, 3 dc] in next ch-2 sp, turn. Rep Rows 2 and 3 until edging is required length, ending with Row 2 of pattern, do not turn. Edging Row: *Ch 3, 1 sc in top of row-end st, rep from * across, ending with 1 sc in the top of beg ch 4. Fasten off. Row 1: Ch 6, dc in 6th chain from hook, turn. Row 2: Ch 3 (counts as dc here and throughout), 13 dc in ch-5 sp, turn. Row 3: Ch 7, sk first 6 dc, (dc, ch 5, dc) in next dc, turn. Row 4: Ch 3, 13 dc in ch-5 sp, dc in next ch-7 loop, turn. Row 5: Ch 7, sk first 7 dc, (dc, ch 5, dc) in next dc, turn. Repeat Rows 4 and 5 for desired length of trim, ending with Row 4. Fasten off. Note: Work from the narrow end. Ch 14. Row 1: 1 dc in 4th ch from hook, 1 dc in each of the next 4 ch, ch 3, sk next 2 ch, 1 sc in next ch, ch 3, sk next 2 ch, [1 dc, ch 5, 1 sl st] in last ch, turn. Row 2: [1 sc, 2 hdc, 5 dc] in first ch-5 sp, 1 dc in next dc, ch 5, sk next 2 ch-3 sps, 1 dc in next dc, ch 5, sk next 4 dc, 1 dc in top of tch, turn. Row 3: Ch 3 (counts as first dc), 4 dc in next ch-5 sp, 1 dc in next dc, ch 3, 1 sc in next ch-5 sp, ch 3, [1 dc, ch 5, 1 Sl st] in next dc, turn. Rep Rows 2 and 3 for pattern. Ch a multiple of 10 plus 3. Row 1: Sc in 2nd ch from hook, sc in each ch across row, turn. Row 2: Ch 1, sc in each of first 2 sc, ch 15, sc in 2nd ch from hook. Work 15 sc over the ch just made, (16 sc in all), sl st in each of next 2 sc in Row 1, turn. Row 3: Ch 1, sk next 2 sl sts, working in back loops only, sc in each of next 15 sc, turn, leaving rem sc unworked. Row 4: Ch 3, sc in 3rd ch from hook (picot made), sc in back loop of each of next 5 sc, turn. Row 5: Ch 1, sc in back loop of each of next 4 sc, turn, leaving remaining sts unworked. Row 6: Work picot, sc in back loop of each of next 4 sc, sc in back loop of each of next 2 sc, 3 rows below, turn. Rows 7–14: [Rep Rows 5 and 6] 4 times. (6 picots on scroll) Row 15: Working in both loops of sts, sc in each of next 8 sc on Row 1, ch 15, turn, sl st in 3rd picot from bottom of previous scroll just completed (Row 10), ch 1, turn, work 15 sc over long ch just made, working in both loops of sts, sl st in each of the next 2 sc on Row 1. Rep Rows 3–15 until 10 sc remain on Row 1; then rep Rows 3–14 once. Fasten off. Take charge of the fit and details of your crocheted garments, with guidance from needle art designer Margaret Hubert! Designers have to create crochet patterns in standard sizes, but very few people’s bodies actually match up to those “average” measurements. Customize Your Crochet teaches crocheters how to adjust standard size patterns to fit their unique measurements. The techniques and processes taught in this book are the same ones that designer Margaret Hubert has used for years to teach classes on custom fitting. With this book, individual crocheters can learn to adjust patterns to fit themselves and the others for whom they crochet. 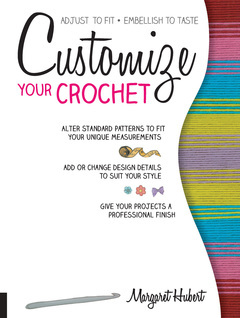 But Customize Your Crochet goes beyond a basic, good fit to help the crocheter create a truly custom garment. Maybe you’d like that neckline a little higher, or you’d like a little flare to the sleeves. With this book, you can add individual details and give your crocheted creations personal style. Diagrams and illustrations are used throughout to explain body shapes and make comparing measurements simple. Step-by-step photography shows the details for garment construction, specific increases, decreases and other shaping methods, as well as finishing techniques and embellishments. Jump in and be confident that your next project will match your shape and style to perfection!